I am happy to share with all my readers that I have been selected as a P&Gmom along with some other great Canadian Bloggers. 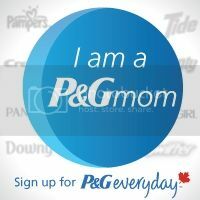 This is the first time P&G has done a blog ambassador program in Canada. Tomorrow we are gathering at the Four Seasons in Toronto for this blogger event. I can't wait to be able to share with you all I learn tomorrow about P&G. Tomorrow I will also have the pleasure of meeting Canadian Olympic Bronze Medalist Hurdler and new mom Priscilla Lopes-Schilep. We all know how much I love to save money and one of the workshops I get to attend tomorrow is how to make the most out of your family budget!!! Something I am very passionate about and many of my readers are also passionate about saving money and staying on budget. Who can't use the reminder or some tips at Christmas time. But since I can't share anything with you just yet because the event isn't until tomorrow there is something I would love to share with you. P&G Brandsaver Coupon Book is now up online where you can find $164 in savings as well as in your local paper so keep your eyes peeled for this great Coupon Book just in time to save extra money for Christmas. If you want to keep up with the event tomorrow please check out #PGMom on twitter for all the bloggers sharing information they are getting at the event tomorrow. Until next time stay safe and spread some love!